I can't quite believe it. 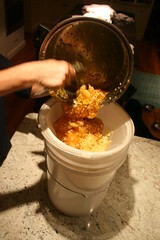 I collected honey from my own hives! It's a cool feeling. Yesterday I opened my white hive, the healthier of my two. it has two deep boxes and one super. I checked the deeps and they are full, with the exception of the far half of one outside frame. I didn't pull out frames, just checked from the top. They are also full of lots of bees. It seems the bees have settled down - much less aggressive than they were in the heat of summer. 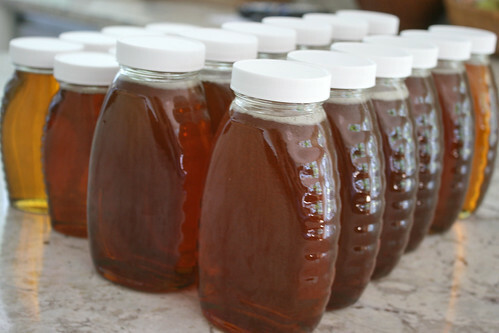 Anyway, I took all of the honey out of the super - five full frames. It was pretty easy to just tap the bees off of them. I brought the frames up to the house in a garden trug and replaced the super and honey coated queen excluder back on the hive hoping the bees will clean them up for me. Once at the house I transferred the frames to a plastic box with a lid. I made the mistake of leaving the trug outside on our patio table. It set of a small feeding frenzy as hundreds of bees came to clean out honey left in it. Pretty impressive. 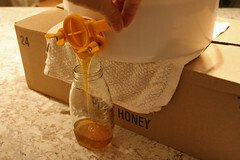 I am planning to use a honey sieve and gravity strain the honey. 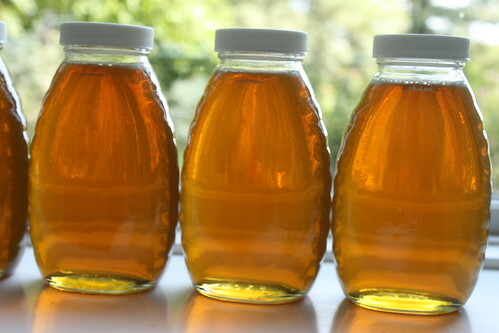 Five frames isn't very much for most beekeepers, so this simple method makes the most sense. Hopefully I can do that tomorrow. 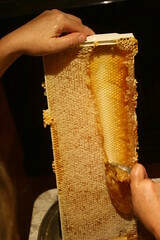 I'll check my second hive soon too, but not expecting much if any honey. This hive was without a queen for a month this summer and lagged behind the other one. I'll remove what's there so I can take the supers off for winter.